Hi guys quick question. 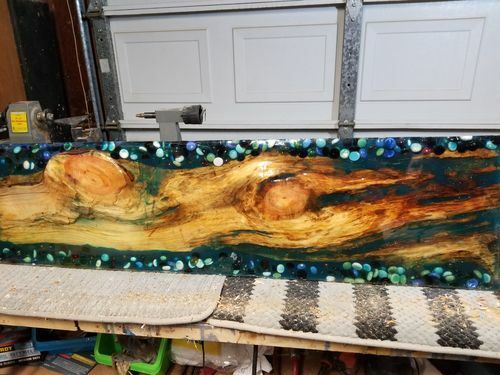 Of them working on a piece of wood that I encased in a epoxy. I started out with the idea of doing a bench top.now that I am nearing completion I am torn on what to do with it. Should I hang it on the wall? Or should I continue on with the original plan of making it a bench? That’s neat…I like it. But then I like all things that are different or unusual. For what it’s worth, here is what I do when I have something unusual and am not sure what to do with it or what to make it into…I set it aside and give it some time. Eventually, if I stare at something long enough it hits me exactly what needs to happen to it. 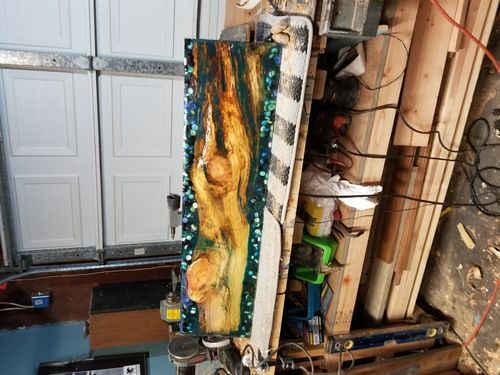 Without exception, every time I had a special piece of wood and I thought I knew what it needed to be, it just didn’t turn out. When it hits you, you know…and if you set it aside, but not out of sight, it will hit you and you will know. Sounds off the wall and maybe it is, but it works for me. +1 on set it aside. I’ve had the same experience. Sometimes the wife will walk through the shop and spot something that needs to be something else. She is never wrong. Maybe you can sell it to a wacky kitschy bar or something. Very “out there” look.